Stay green. Keep connected. Be powerful. 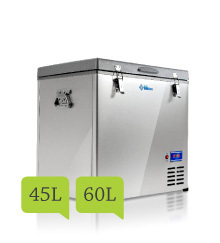 G & P - Solar manufacture an impressive range of portable fridges and freezers, ideal for camping, boating, hunting, fishing, cars, trucks, 4WDs, caravans and motor homes. 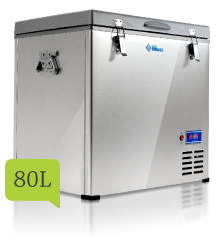 Our extensive product range includes compact 26 and 45L options and more expansive 60 and 80L units. All of our fridge/freezer designs are extremely energy efficient, making them ideal for use with solar chargers, and available with either AC or DC power. 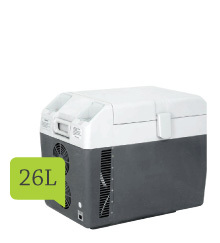 These great solar energy fridges are sold separately, and run off any solar panel system with equivalent voltage current, such as our great range of portable panels. Panels and batteries sold separately. These ultra efficient units have exceptionally low energy consumption, require a smaller, less expensive power system, and have a low operating cost. Can operate on less than 45 watts of solar power in most climates.